Can We Just Leave Beast Mode Alone? Clearly the guy doesn’t enjoy talking with the media, can we just leave it alone? I think it is totally ridiculous that there are provisions written into NFL contracts that force players to speak with the media under penalty of fine. These are professional athletes we are talking about! First off, most of them sound like idiots because guess what? They weren’t studying Shakespeare in college! Secondly, the ones you do hear from, and that can speak well, will speak to the media. They will do this with or without a rule in their contract. 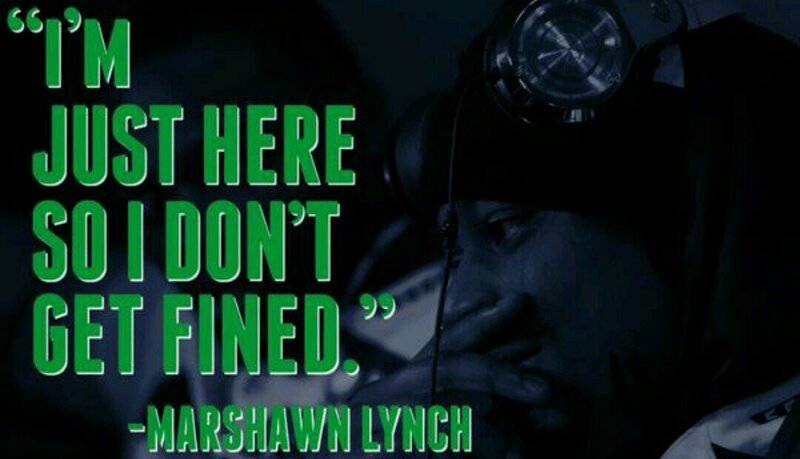 Is it really necessary to put a guy like Lynch on blast for doing the bare minimum at media day? 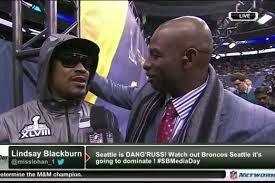 PS- Deion, would you have liked to be harassed like this if you didn’t want to speak with media back when you played? HELL NO. Beast mode is clearly hiding from you and everyone else. Feed him some Skittles and move on! Posted on January 29, 2014, in Average Blog Posts and tagged beast mode, deion sanders, denver, lynch, marshawn lynch, media day, NFL, reproters, skittles, Super Bowl, superbowl. Bookmark the permalink. Leave a comment.